When I think of a Father’s Day menu, I immediately want hefty food that has plenty of healthy going on too. My own dad liked a big meal, a big bite, and a lotta crunch. Ditto his sons, who will be eating this Father’s Day meal in honor of their own fatherhood, to be sure, but also, and always, in honor of Dad. Something about the wedge salad just says male to me. It’s hunky, it’s hefty. It’s chompy. It’s got Father’s Day written all over it. I’ve always been a fan of the wedge/blue cheese salad. Perhaps because the iceberg is really there for texture, as a crunchy conduit for blue cheese. Those salads, however, are no longer part of my program. I may cajole you into ordering one if we’re out, though, just so I can have a bite. How about a healthy wedge salad, one with our special flavors–a fattoush salad transformed into a wedge? 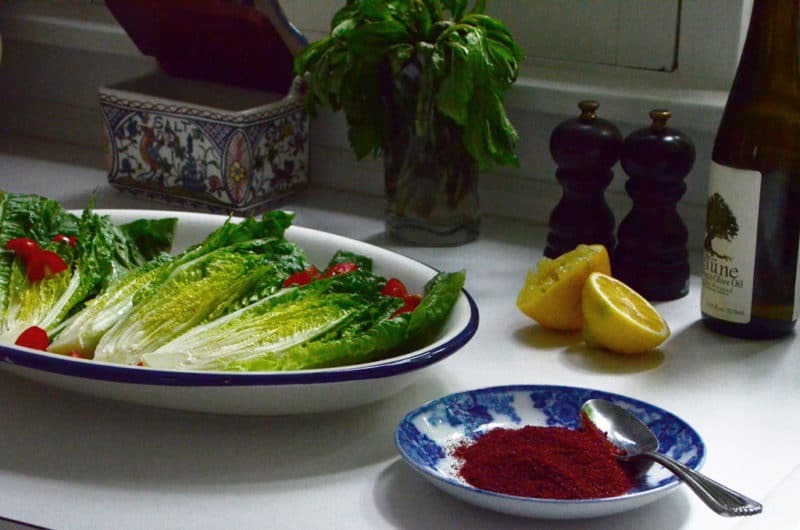 You get that big, beautiful romaine half, with a layering of lemon, mint, and sumac. The wedge takes up a nice portion of the plate, the way green veggies should. And between the fresh lettuce and the pita chips, you can chomp to your heart’s content and never feel anything but good about yourself, and what Dad’s eating. Pile some of the tomato, onion and pita chips around the wedge on the plate. 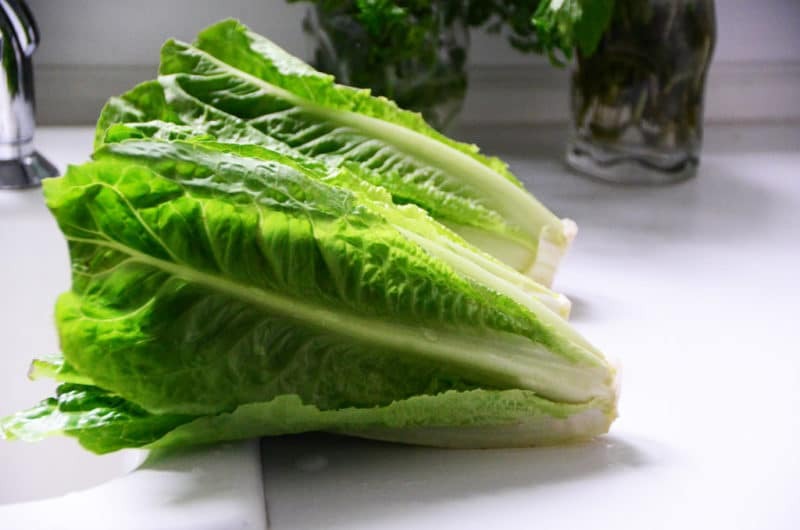 Be sure to clean the romaine all the way through and down to the core by gently pulling each leaf away from the core and running plenty of cool water through. Makes 4 wedge salads. For the vinaigrette, in a small bowl, combine the lemon, garlic powder, salt, and olive oil with a small whisk or fork until emulsified. Trim the romaine and slice off the bottom of the core. Cut each head in half and arrange on a platter. Place the tomatoes and onion in a small bowl and dress with a bit of the vinaigrette. Scatter the tomatoes, onion, and pita chips over the romaine halves and all around the platter (scoop these over the salad when it’s served). Sprinkle the sumac and mint over the wedges (and a little on the platter for show) and season with freshly ground black pepper. Pour the remaining dressing evenly over each wedge. Sprinkle a little more sumac over the salads and a pinch of salt. When serving, scoop the extra vegetables and pita from the platter over the wedge. 11 Responses to "Father’s Day Menu: Fattoush Wedge Salads with Sumac"
Happens to both look manly and pretty at the same time! My wife has her work cut-out for her this weekend. Hi Maureen, I like to saute my pita bread (in bite-size pieces) in a little olive oil and zaatar. So good in a fattoush salad! What a fantastic idea! 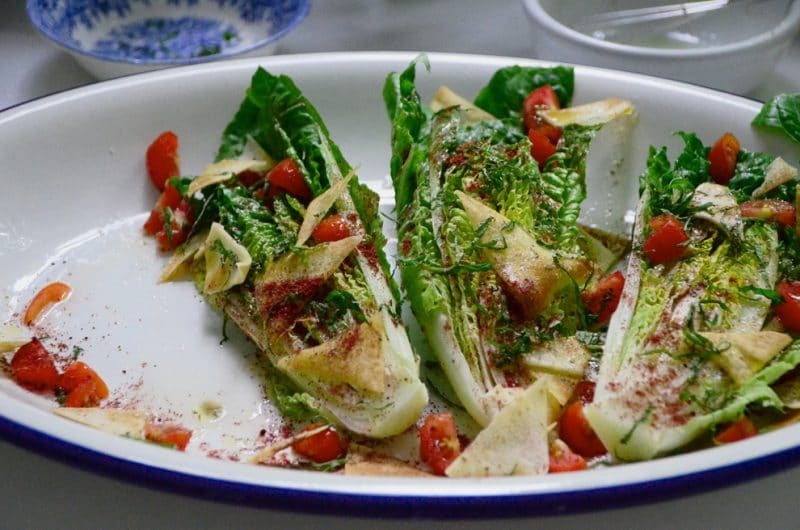 I love fatoush, but I absolutely love the presentation of this salad, so this is it for me! I use the miniature San Marzano tomatoes for salads now, and the difference is incredible, plus I always use fresh garlic. I just use my mortar and pestle with some kosher salt and add it to the lemon juice and olive oil. To me, the difference in taste is worth the effort. 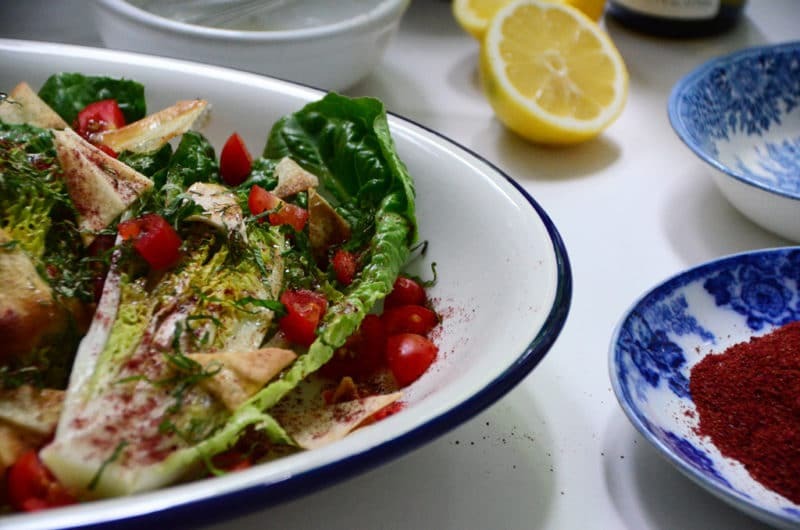 Your approach sounds so delicious Mary, and I’m so happy to hear this take on the fattoush is right up your alley! Please enjoy and let me know how it goes!